Pitting is also referred to as box car or ice pick scarring, depending on shape. Atrophic scars, or the depressed, crater-like pits that appear in skin after a bad acne breakout, can be difficult to ignore and may prove difficult to cover with makeup. These deep injuries are a result of tissue loss, as even mild acne inflammation destroys collagen beneath the skin. Typically, once the scar is permanent, a dermatologist will replace the lost tissue with natural fat or other fillers to plump the skin back to its original level or perform surgical excision of the area. Catch acne pitting and inflammation in the early stages to prevent permanent scarring. Wash the skin daily with a mild cleanser, and moisturize with an oil-free lotion to prevent acne breakouts. Exfoliate the skin with a gentle facial scrub once each week to remove the dead skin cells that clog pores and cause breakouts. Dab corticosteroid cream on inflamed acne bumps for a single night. Remove the gauze from an adhesive bandage, so that the gauze does not absorb the cream, and place it over the acne overnight. Remove the bandage in the morning. Acne swelling should be significantly reduced. Apply ice to red, swollen acne bumps as often as possible to reduce inflammation. Treat acne wounds and new scars daily with Aloe Vera cream, tea tree oil, vitamin A cream or vitamin E oil to reduce scar appearance. Dab only a small amount of the selected product on the scar once each day to promote healing. Consult a dermatologist if the scar persists. Doctors can offer more invasive options, such as scar fillers, microdermabrasion, scar excision and punch grafting. Deep scars can take up to a year to heal naturally. Never squeeze acne, as this can cause deep pitting. Some treatments may irritate sensitive skin. Consult a dermatologist before use if prone to sensitivity. 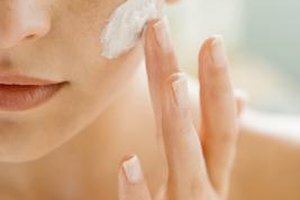 Never use corticosteroid cream on one section of skin for more than one night, or frequently over time. The cream thins skin, and should only be used for occasional, extremely inflamed acne spots.